Florida State students protest far-right bigot Milo Yiannopoulos | Fight Back! 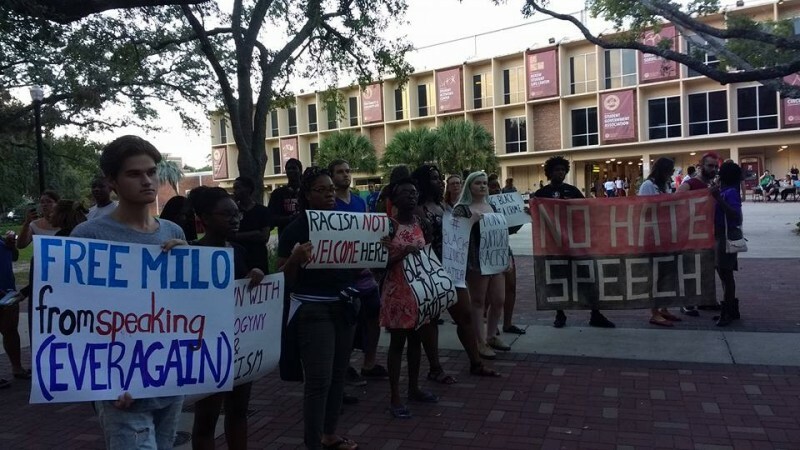 Tallahassee, FL - On Sept. 23, over 40 students gathered at Florida State University (FSU) to protest a speaking event hosted by Milo Yiannopoulos, journalist for far-right website Breitbart News. Milo Yiannopoulos is known for his role in the alt-right political movement which is united around Donald Trump and anti-immigrant attitudes. Yiannopoulos was recently permanently banned from the social media website Twitter for his role in the racist and sexist harassment of African American actress Leslie Jones. He has long been known for his anti-feminist and misogynist rhetoric, including his leadership in the Gamergate controversy, where feminists were harassed for their criticism of sexist video gaming culture. Milo Yiannopoulos has seen his events canceled and himself disinvited by universities for his hateful rhetoric and concerns about safety. Students across the country have protested his events including at Rutgers, University of Minnesota, Depaul University and UCLA. “We are protesting because Milo Yiannopoulos is a racist and misogynist. FSU students are here to stand against his spread of hateful propaganda on our campus. Today we hope to send a message to administration that we will not tolerate hateful bigots speaking here any longer,” said Katherine Draken, member of Students for a Democratic Society (SDS). “Our university is saying, and putting out this lie that our university supports all people and that it is pro-equality when really they are bringing in these people to talk and speak who are totally against that,” said Cea Moline, emcee of the rally and member of SDS. Both the FSU Pride Student Union and the FSU Graduate Assistants United issued statements earlier this week denouncing Milo Yiannopoulos and the decision to bring him to speak on campus. The protest was organized by the FSU chapter of Students for a Democratic Society.